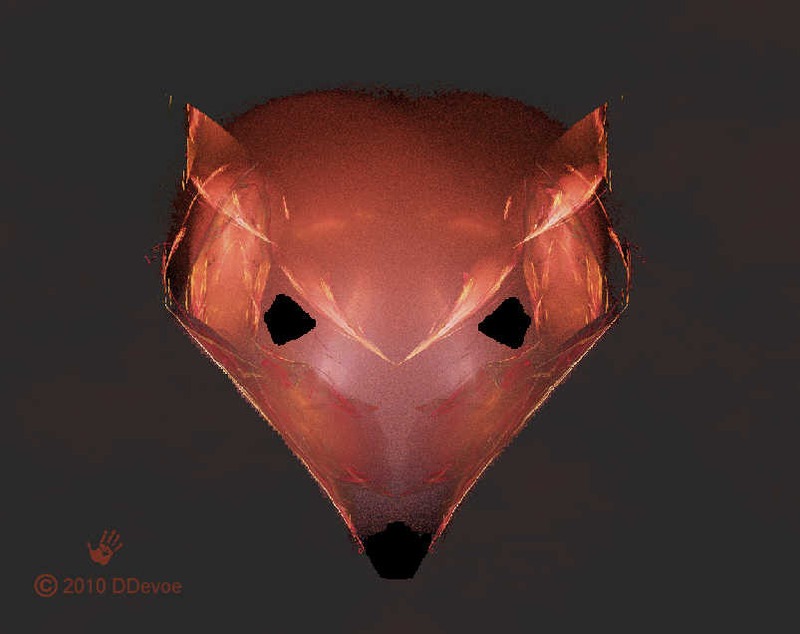 A lucky fractal image which just happens to resemble the head of a red fox. I added a brownish background and just a few brush strokes to finish it off. Image available on a variety of gifts at my Zazzle store. The red fox (Vulpes vulpes) is both the largest of the true foxes and the most widely distributed carnivore in the world. They are found throughout the entire northern hemisphere from the Arctic Circle to North Africa, Central America and Asia. The species is Eurasian in origin and colonized North America shortly after the Wisconsian glaciation about 10,000 years ago. Its range has increased alongside human expansion, having been introduced to Australia, where it is considered harmful to native mammal and bird populations. Adult red fox have a year-round red coat that is typically much more striking during the winter months; a washed out orange to cherry red. The red portions cover the head, shoulders and back, and the rump may be either red or a light gray. Jet black marks the legs and ears and the chest and throat are typically a light gray to white. Red foxes have elongated bodies and relatively short limbs. Males are generally larger than females. Adults may average from 8-12 pounds, and vary in total length from 48 – 57 inches. The tail, which is longer than half the body length (70% of head and body length), is long, fluffy and reaches the ground when in a standing position. Red foxes are very agile, being capable of jumping over 2 metre high fences and swim well. Vixens have three pairs of teats, though vixens with 7, 9 or 10 pairs are not uncommon. Red foxes have binocular vision, but their sight reacts mainly to movement. Their auditory perception is acute, being able to hear black grouses changing roosts at 600 paces, the flight of crows at 1/4-1/2 km and the squeaking of mice at about 100 metres. They are capable of locating sounds to within one degree at 700–3,000 Hz, though less accurately at higher frequencies. Their sense of smell is good, but weaker than that of specialized dogs. Apart from its large size, the red fox is distinguished from other fox species by its ability to adapt quickly to new environments and, unlike most of its cousins, is not listed as Endangered anywhere. Despite its name, the species often produces individuals with abnormal colorings, including albinos and melanists. Forty-five subspecies are currently recognized, which are divided into two categories: the large northern foxes, and the small, primitive southern foxes of Asia and the Middle East. Red foxes are social animals and either establish stable home ranges within particular areas or are itinerant with no fixed abode. Red foxes family units share a joint territory. In favourable habitats and/or areas with low hunting pressure, subordinate foxes may be present in a range. Subordinates are mostly young from the previous year, who aid in rearing the breeding vixen’s kits. Non-breeding vixens will guard, play, groom, provision and retrieve kits, an example of kin selection. Red foxes may leave their families once they reach adulthood if the chances of winning a territory of their own are high. If not, they will stay with their parents, at the cost of postponing their own reproduction. After a gestation period of about 52 days, females give birth to litters that vary in number from 1 to 12, with 3 – 6 being common. Young are born blind and helpless, and are weaned by week 12 when they learn to hunt for themselves. Both males and females play a major role in food acquisition for growing pups. Dens are usually found in abandoned woodchuck or other small mammal burrows, widened to suit the needs of a family of foxes. Their basic structure consists of the main channel, with a chamber or a widening of the main channel, lined with grasses and other forbs to make a dry refuge and birthplace for their pups. Dens vary in location, and may be found among the root systems of large trees along the banks of streams or gullies, in or beneath hollow logs or hedgerows, or anywhere a woodchuck might decide to dig their burrow. It is common to find a den with multiple entrances. As temperatures in the den increase with the onset of summer, red fox will move the pups into a new den site every few weeks to minimize exposure to parasites such as fleas. Red fox are highly mobile and can cover long distances on a daily basis. Travel of greater than 6 miles is not unheard of. Range expansion occurs during the winter months, presumably due to a decreased availability of prey, and contract during the rearing season. Displayed feces and scent posts marked with urine are evidence that red fox are wary of other foxes, and as a result territories seldom overlap. Red foxes are omnivores withhas a variable diet, likely coinciding with local prey populations and seasonal availability of small mammals and birds. Small mammals such as mice, squirrels, woodchucks, and rabbits comprise the majority of their mammalian diet, while birds such as grouse, nesting waterfowl, and other ground-nesting birds and their eggs are the most important avian food items in their diet. Other opportunistic food items such as nestling songbirds, various amphibians and reptiles, invertebrates such as earthworms, and carrion are all consumed as the opportunity presents itself. Additionally, red fox have a sweet tooth as they have been noted to consume ripening grapes and apples in the early autumn. Red foxes prefer to hunt in the early morning hours before sunrise and late evening. When hunting mouse-like prey, they first pinpoint their prey’s location by sound, then leap, sailing high above their quarry, steering in mid-air with their tails, before landing on target up to five metres away. They typically only feed on carrion in the late evening hours and at night. They are extremely possessive of their food, and will defend their catches from even dominant animals. Red foxes may occasionally commit acts of surplus killing; during one breeding season, four foxes were recorded to have killed circa 200 black-headed gulls each, with peaks during dark, windy hours when flying conditions were unfavorable. Losses to poultry and penned game birds can be substantial because of this. Red foxes seem to dislike the taste of moles, but will nonetheless catch them alive and present them to their kids as playthings. Use of food caches is common for this species. Foraging behaviors most commonly seen include erratic movements in open grassland, head and ears erect searching for the slightest rustle of grass or a glimpse of fur. 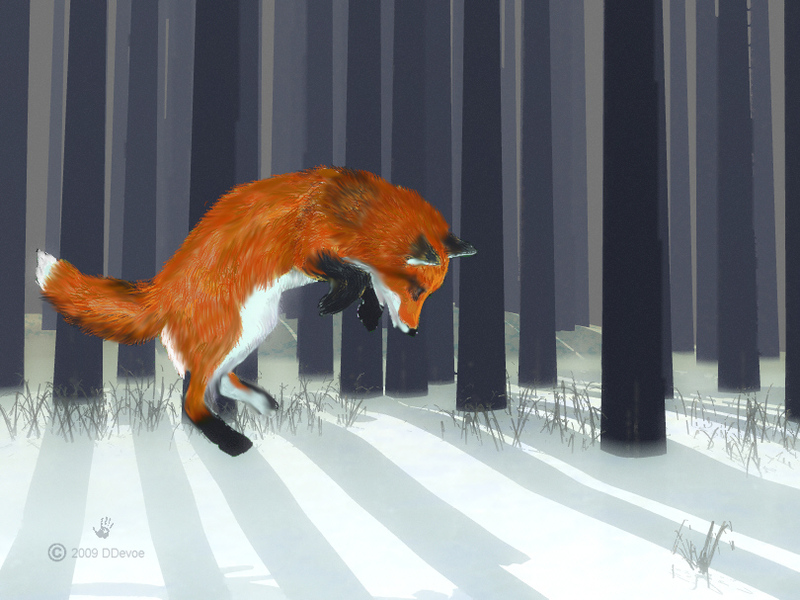 Once a prey item is located, a fox will freeze, presumably to zero in on the location, followed by a quick aerial pounce and capture of the prey. The species has a long history of association with humans, having been extensively hunted as a pest and fur bearer for centuries, as well as being prominently represented in human folklore and mythology. Because of its widespread distribution and large population, the red fox is one of the most important fur bearing animals harvested for the fur trade. Because of their abundance, red foxes are among the most important furbearing animals harvested by the fur trade. Their pelts are used for trimmings, scarfs, muffs, jackets and coats. They are principally used as trimming for both cloth coats and fur garments, including evening wraps. The pelts of silver-morph foxes are popular as capes, while cross foxes are mostly used for scarfs and very rarely trimming. The number of sold fox scarfs exceeds the total number of scarfs made from other furbearers. However, this amount is overshadowed by the total number of fox pelts used for trimming purposes. The silver morphs are the most valued by furriers, followed by the cross and red morphs respectively. In the early 20th century, over 1,000 American fox skins were imported to Britain annually, while 500,000 were exported annually from Germany and Russia. The total worldwide trade of wild red foxes in 1985–86 was 1,543,995 pelts. Foxes amounted to 45% of US wild-caught pelts worth $50 million. North American red foxes, particularly those of northern Alaska, are the most valued for their fur, as they have guard hairs of a very silky texture which, after dressing, allow the wearer unrestricted mobility. 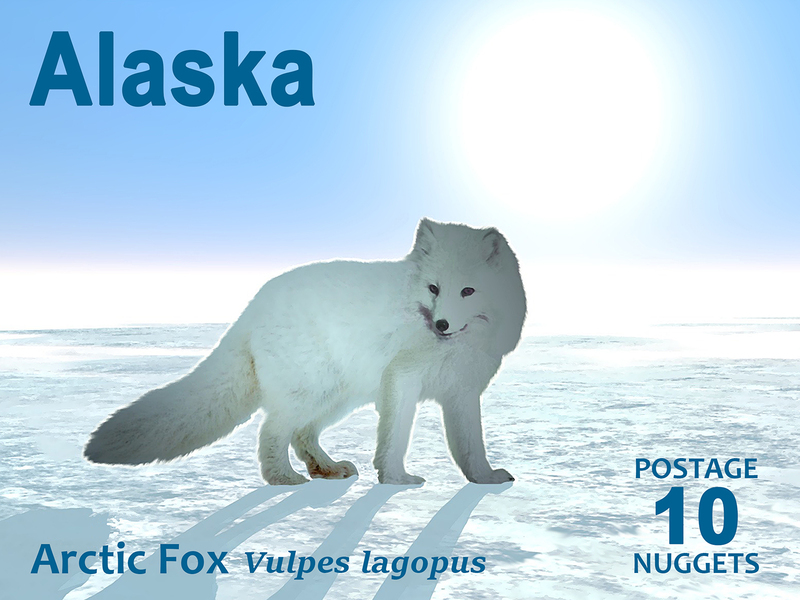 Red foxes living in southern Alaska’s coastal areas and the Aleutian Islands are an exception, as they have extremely coarse pelts which rarely exceed one third of the price of their northern Alaskan cousins. Most European pelts have very coarse textured fur compared to North American varieties. The only exceptions are the Nordic and Far Eastern Russian pelts, but they are still inferior to North American pelts in terms of silkiness. In the winter red foxes hunt rodents living under the snow cover. With acute hearing they are able to locate the animal; then jumping high in the air they pounce. This image was one of my early efforts at using DAZ Bryce to generate a background landscape.